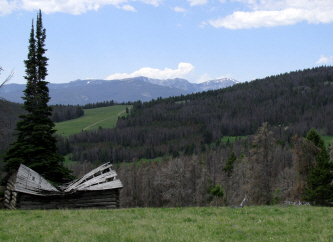 320 Plus Acres in the Elkhorn Mountains! Creek! There is gold in them thar hills! All the mineral rights transfer with this property so you can try your hand at mining if you want. Great history goes with this area with mining dating back to 1888... you even have water rights from 1888 if you wish to do some mining. This area is located in the Elkhorn Wildlife Management Area, an area known for elk, deer, bear, moose, mountain goats and bighorn sheep. Access is via a designated travel route for the National Forest, NFS 360, about 13 miles from state highway 287 and the town of Townsend. About 40 miles south of Helena and 70 miles north of Bozeman.